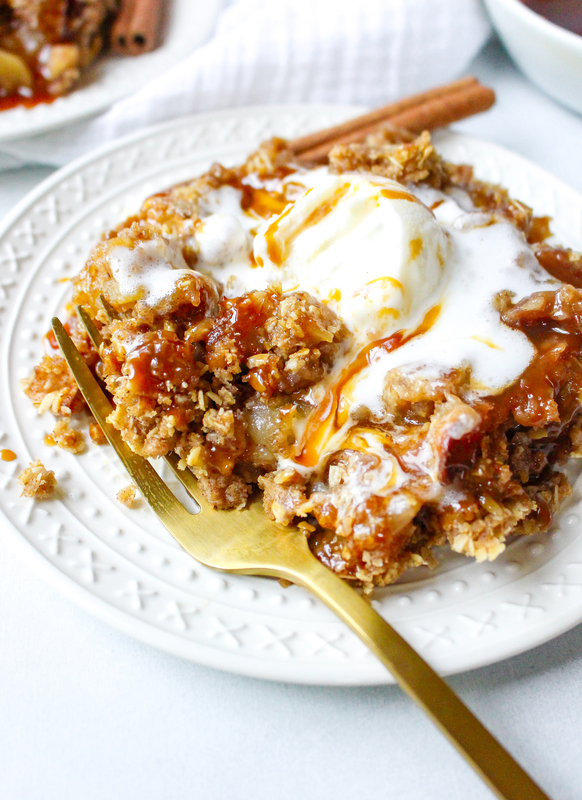 We don’t need another apple crisp recipe. There are already 34892365 versions of this dessert floating out there in the interwebs. What makes this one special? I’m putting it both in the apples and in the crumble so that the chai flavors hit us in the face. In a good way, of course. I know chai is SUCH a big trend right now (it has been going strong for a few years now), and the truth is, I’ve been enjoying the flavors of chai for YEARS. One of my best friends, Cara, turned me onto chai tea way back in our early 20s when we were living together. In the evenings, she would make a fragrant, cozy cup for herself. Eventually, I asked her what the heck smelled so good. And moments later, I was a full-on chai convert. It was sweet (but not cloyingly so) and spiced and incredibly comforting. It was ideal for sipping on a cold evening. So, thanks to Cara for my initial discovery. I have a feeling, however, with chai being in EVERYTHING now, I would eventually discover it on my own. I mean, how could you not? It is taking over the world. 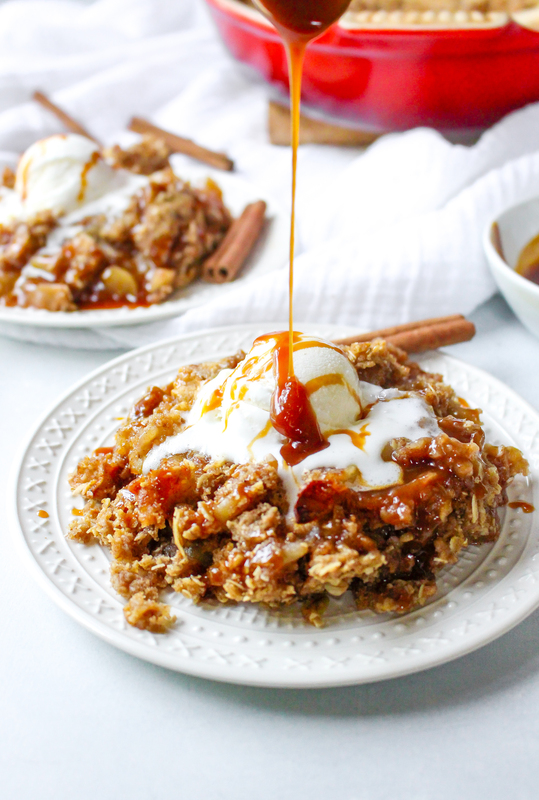 The thing about this chai apple crisp is that it’s not TOO different from a more traditional apple crisp. 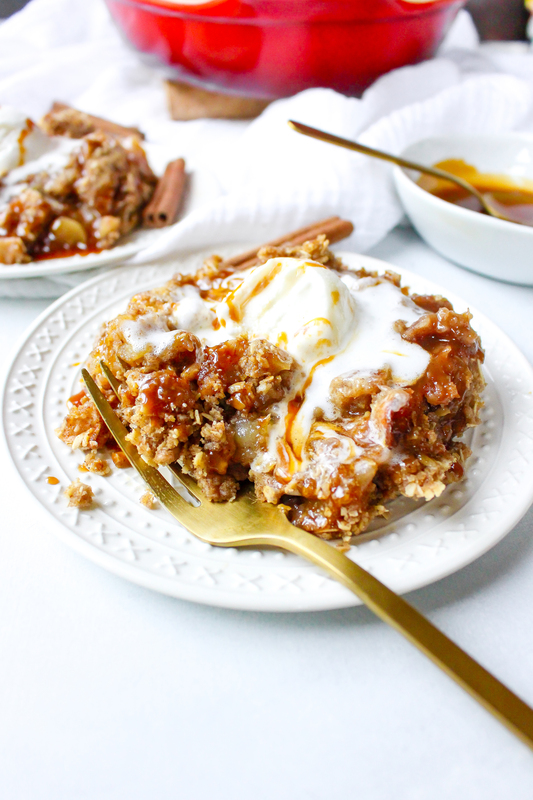 After all, cinnamon and nutmeg probably go into 95% of apple crisp recipes, but in this case, the warming floral flavor of cardamom and spicy ginger take things to a new, different, and dare I say it, BETTER place. The cloves and allspice play their parts, too, but I think the combination of cinnamon, cardamom, and ginger is a magical one. I think they are the reason I am so chai obsessed! 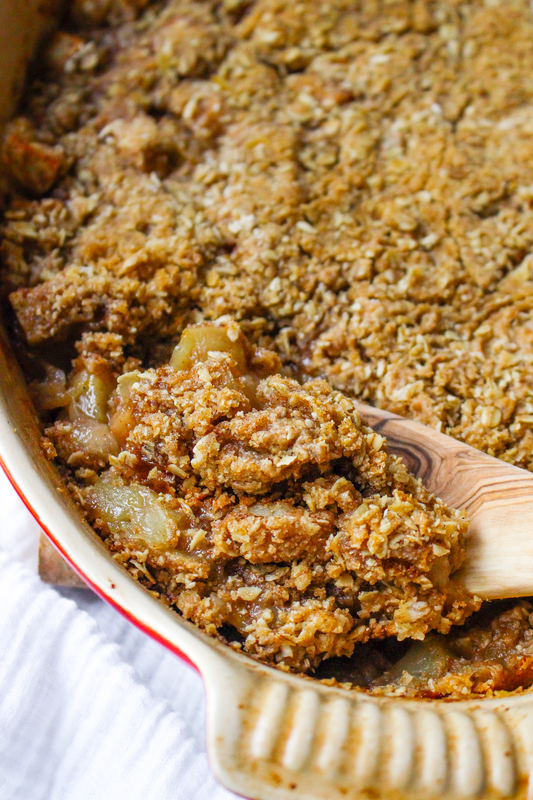 Like most crisp and crumble recipes, this one is pretty straight forward. 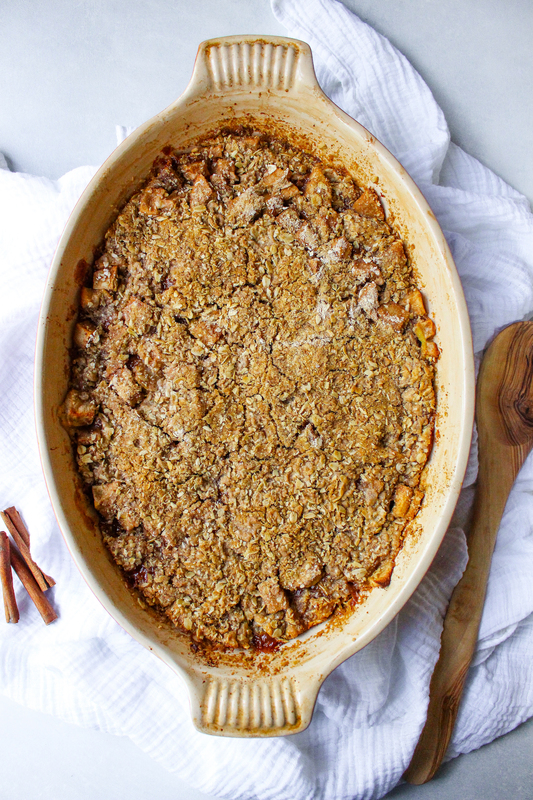 Peel and chop your apples, toss with the spice, sugar, fresh lemon, and get them in a baking dish. Dot with butter (because…butter makes everything better). 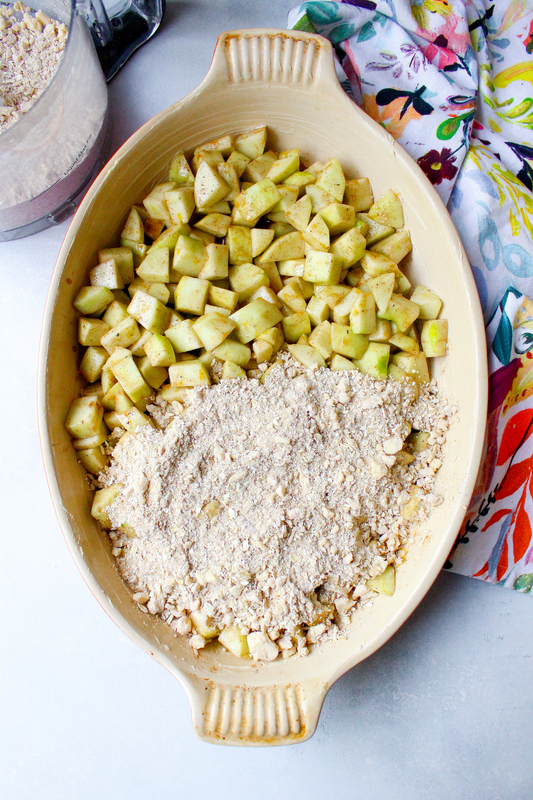 And then mix together the crumble topping, either by hand or in the food processor! I used the latter and it makes desserts like this SUCH a cinch. Bake and then serve hot and topped with a generous scoop of vanilla bean ice cream! And if you’re feeling extra indulgent (something I am in favor of! 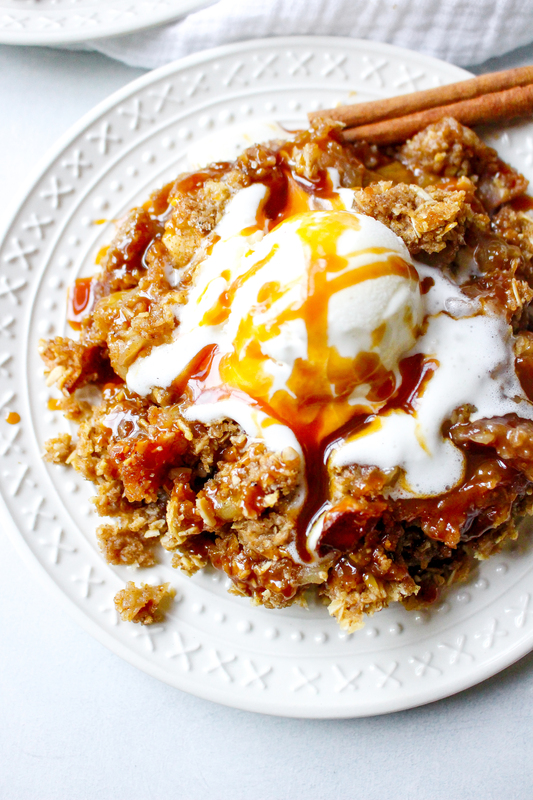 ), drizzle on some caramel sauce. 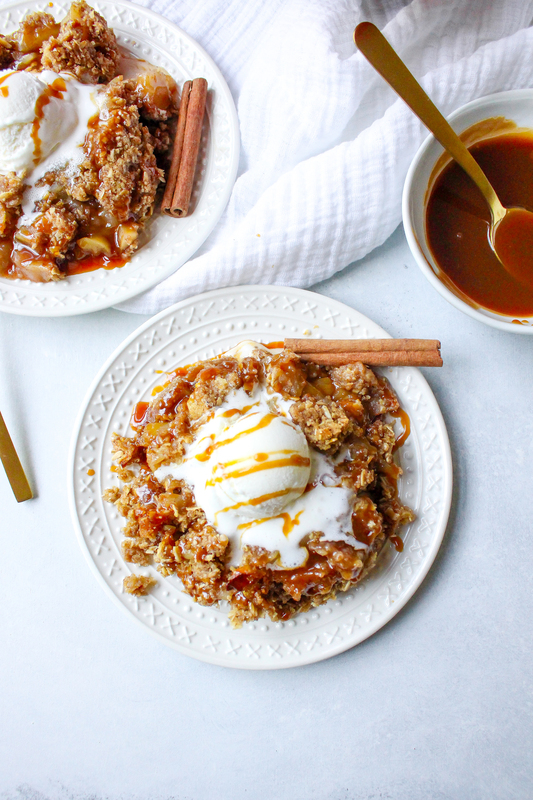 If you want even more chai spice, try out this chai caramel. Oh heavens. That stuff is DREAMY. Plate this up and pass out to your family and friends. Combine the apples, sugars, flour, spices, lemon juice/zest, and salt in a large bowl. Mix well until everything is evenly coated. Place the apples in the prepared baking dish, spread in an even layer, and dot the butter cubes over top (spread them out as evenly as possible). Combine the oats, spices, flour, sugars, and salt in the bowl of a food processor. Pulse to mix. Add the cold butter and pulse until just incorporated and crumbly. 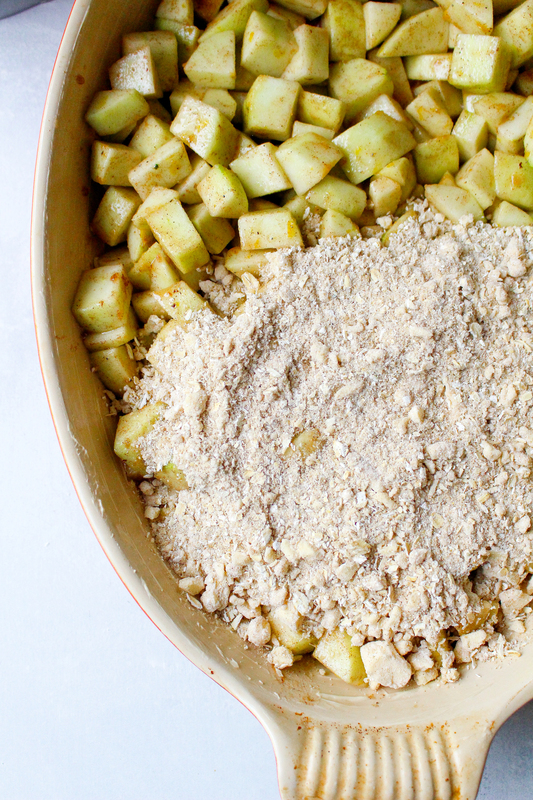 Evenly distribute the streusel over the top of the apples and place in the preheated oven. Bake for 35-45 minutes or until bubbly and golden. Allow to cool slightly before serving. 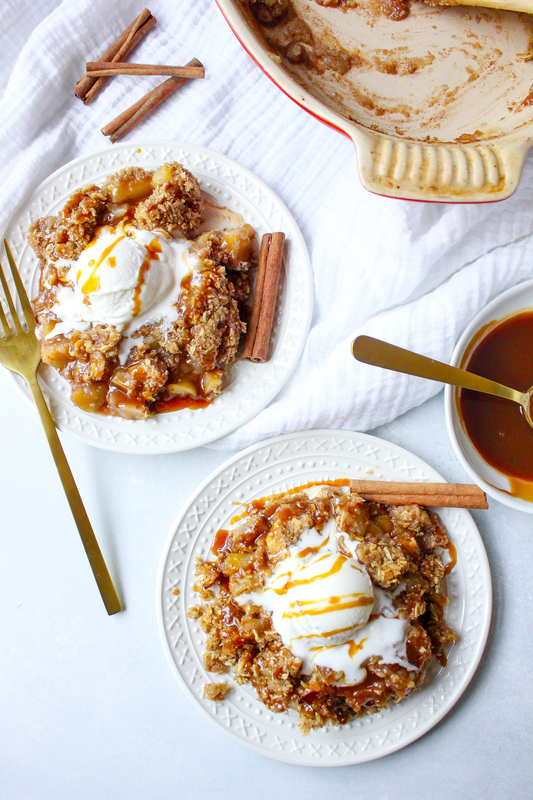 Serve warm with ice cream and drizzled with caramel (this chai caramel would work perfectly here!). Ahh, this sounds perfect!! Mouthwatering, in fact. Hi! This looks delicious, I’m planning on making it for my Thanksgiving dessert. I’m hoping to make this the day before. Would refrigerating the raw product for 24 hours before baking day-of affect the texture or the way the crisp bakes the next day? Hi Carolyn, I don’t think it will have any negative effect on the texture. I would just let it come to room temperature again before baking. I hope you love it!